Yesterday after I posted two b&w commercials, I got thinking about the events that lead up to my mother finally allowing us to have a color TV. I don’t usually talk about my childhood, but just this once I’ll tell you more than you’ll probably ever want to know about me– and how it came to be that my mother allowed the two of us to have an extravagance such as a color TV. In May of my freshman year of high school we had unusually intense spring thunderstorms. Very windy, very rainy, with lots of lightning. Our house didn’t have cable so to get reception our TV had an antennae attached to it. One night after Mom and I had gone to bed a bolt of lightning hit the antennae, came into the house, and went straight to the TV (which was off at the time). In an instant, the old b&w TV caught on fire. The burning TV sounded like someone making popcorn. In fact, when I heard the popping sound I figured that Mom couldn’t sleep and had got up to make herself a snack. Naturally, I wanted some of it so I hurried into the kitchen to get something to eat. But what I found in the kitchen was my mother on the phone with our small town fire department. They responded quickly and almost the entire fire department arrived to watch our TV burn up. This was because most of the firemen had heard about how old TVs could catch on fire, but had never actually seen one in real life on fire, so this was a learning experience for them. They dragged the TV outside into the rain and then axed it to pieces. There was almost no damage to the inside of the house, but the old b&w TV was toast. Weird as it is to say, the dramatic end of our TV got Mom and me laughing every time we talked about it. The whole absurd thing was funny to us. Already that year: 1) my dad had died after a lengthy illness; 2) I’d had major surgery on my knee; and 3) while driving into the garage Mom had accidentally run over the family cat [who went on to live a very long and grouchy life]. So having your TV burst into flames seemed rather minor to us. Just something to laugh about. Endlessly. Which was just as well considering that Mom had lots of bills to pay– and getting a new TV was not a priority. So for the next twelve months we lived in a very quiet home with only the radio, playing cards, boxed games and books for entertainment. Eventually Mom decided that it was time for us to get a new television. She and I went to some local furniture/appliance store where we bought a brand-new top-of-the-line [Magnavox, maybe?] color TV. Go for an early morning walk. Upon returning home but before entering the house– pluck stray dried leaves out of the pot of rosemary that sits on the front stoop. Enter home and immediately go to desktop computer to catch up on email. When finished with email– shower and dress for the day. Return to home office and sit down in front of computer to start day in earnest. Posted on November 11, 2011 Categories Daily LifeTags Humor, In The Garden, Learning, NaBloPoMo, Snippets Of Life9 Comments on Well, Who’d Of Thought? We went to a college football game yesterday afternoon. The weather was clear and crisp with lots of sunshine. Our club seats were wonderful and the home team won. After watching the marching bands in the halftime show, I’d had enough of sitting in the sun. I suggested to Zen-Den that we go inside to the private eating area and get something to eat. Then I suggested in the most adamant terms possible that we should stay inside in the shade to watch the third quarter on one of the many TVs provided therein. He went along with my idea because: 1) he’s older now and has learned that when he goes to a game he doesn’t have to watch every second of it live to enjoy the game; and 2) I mentioned food. We got our food, found a nice place to sit and were in the process of munching when we heard the marching band. At first we thought that it was on TV but realized that the noise was getting louder and louder. [Hello doppler effect.] The noise was coming from the other side of eating area, so we turned around to see what was happening. What we saw were 9 members of the flugelhorn section of the home team’s marching band– in full dress band uniform– not quite marching, but kind of kick stepping through the room. 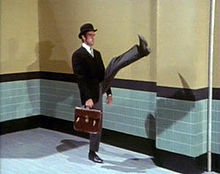 [Think John Cleese in the Minister of Funny Walks.] They were playing the home team’s fight song–very loudly and not all that tunefully. It was Monty Pythonesque absurdity at it’s best. Both of us started to laugh so hard that we were crying. We couldn’t figure out why a roaming band of flugelhornists had chosen to visit the club section of the stadium. Was this a reward for them or a punishment for them within the band hierarchy? Was this a reward for those of us who had paid more for club seats– or was it a punishment for those of us who didn’t get invited to the classy box seats on the quiet level above? Who knew? Nor could we figure out if these were first team flugelhornists– or, as Z-D suggested, the freshman reserve flugelhornists allowed to strut their stuff later in the game when a victory was certain. Considering that they weren’t exactly on key, I’m going with freshman reserve. I suspect that we’ll never know the answers to these probing questions about the inner workings of Team Flugelhorn. And that’s okay. I like a bit of mystery in my life. But what I do know is that we’ll always remember attending this football game– and our chance encounter with a roaming band of very loud flugelhornists. I would never of thought that I’d end up living in suburbia. I’d say I’m more of a city chick– or maybe an old neighborhood near the city chick– or even a historical preservation district in a suburb of a city chick. But not a suburban babe [as my cousin calls me]. Yet, I’m here and I like it. Chalk one up to my ability to adapt. And chalk another one up to my ability to be amused by what goes on around here. November is when we have our annual Mom Trails HOA meeting. It’s not mandatory that everyone go to the meeting, and we don’t go. It is mandatory that everyone vote via a paper ballot that is sent to us in the snail mail. You check your choices for the board members; say “yes” or ”no” regarding neighborhood issues; and can add some comments, if you are so inclined. Then you send the ballot back to the HOA. Choosing board members is easy. Very few people want to be on the board, so those who do want to do it seem to be sincere. We’ve been happy with just about everything that the board has done since we moved here. Consequently, we rarely have had any comments to add to the comment section of the ballot. Things are good, as far as we can tell. The voting gets more interesting on the “yes” or “no” questions. This is where I get to see what my neighbors are worrying about this year. And, for once, I think that these people are really asking us to decide on something of value to the whole community– rather than the more personal, backstabbing issues that sometimes show up on the ballot. So, what are we voting on here in Mom Trails this year? Glad you asked. We are deciding two things. √ First, we are deciding whether it is appropriate to hang large, non-US flags on our property; and where said flags of all sorts, if allowed, will be hung. Personally, I don’t care what flag you hang in front of your house. What I care about is how you hang it. That is, don’t hang your large flag from the back of your mailbox post with the flag pointing back toward the house. It is, in my understanding, an insult to whatever the flag is representing; and, as I am driving down the street, it hides from my view whoever might be standing on the other side it. √ And second, we are deciding if we will upgrade our standard, township-issue, green background/white lettering street signs to something more stylish. Something that will coordinate with our black, historically accurate, reproduction gaslight-style street lights. Now this is an issue that makes sense to me. Our boring green street signs are difficult to see because they fade into the lawns that surround them. Plus they’re ho-hum. Our street lights, on the other hand, look great and are distinct; you notice them. So, it seems to me that by changing the street signs to coordinate with the street lights we will be able to see our street signs [finally] and add some style [aka resale value] to our subdivision. The actual meeting isn’t until later in the month– and because no one on the board seems to know anything about updating our official Mom Trails website– I won’t know what has happened for a while after that. One day, sometime in early December, we’ll receive a snail mail letter telling us the news. And then, we will think no more about the HOA for another year. I stopped at Barnes & Noble the other day. As soon as I stepped inside the store I realized that the entire bookstore was in the process of a major re-do. All the main aisles had long tables extending lengthwise down the middle of them. All the smaller side aisles had push carts piled with books. The place was a mess. And I couldn’t have been any more pleased. So, slightly giddy with the sense of adventure that comes from exploring the unknown, I started on a Treasure Hunt— looking at the 80% off books on the long tables. It was like browsing at a library used book sale where you never know what you might find. 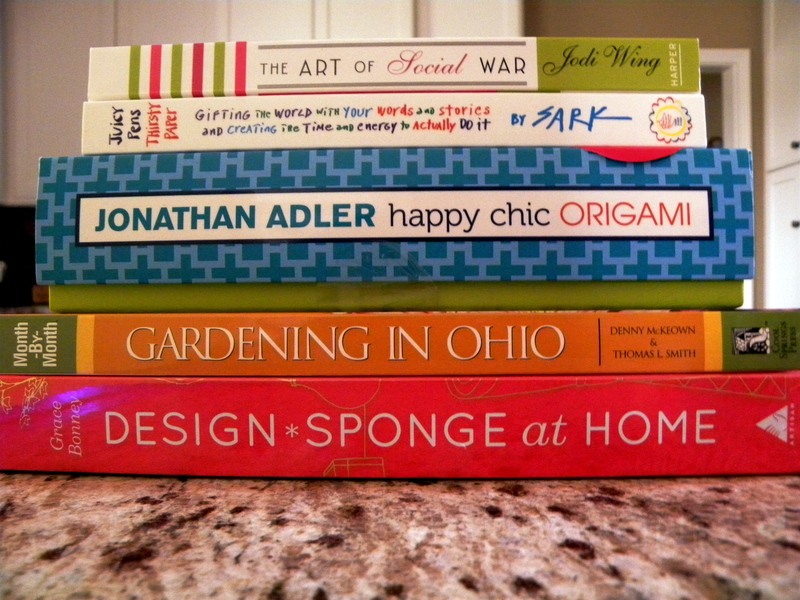 Naturally I found a few books I needed. Then I decided to search with purpose for the books that I’d come into the store to buy. That’s when the real fun started as I began my own little game of I Spy. I found Humor under Cookbooks. Well, yes… I have made a number of miserable meals that elicited laughs. I found Sports under Photography. Which, considering how much bending and leaning I do to take a good photo, seemed somewhat accurate to me. I found Home Decor under New Age/Philosophy. Which sort of made sense to me… in a very existential, post-modern, Unhappy Hipsters sort of way. I don’t know why this shopping trip entertained me so, but it did. Adventure. Absurdity. New [discounted] books. And a story to tell. … It’s a quiet life I live, but a happy one. It’s been hotter than normal around here this summer. Late yesterday afternoon, when the heat and humidity were at their worst, I went to the grocery. It was a miserable time to be outside. Standing under the awning outside the entrance to the doors to the store were two boys about 15 years old. The first kid, Frick, was big and had very curly, light brown hair; his smile was ginormous. Behind him was a super skinny, shorter kid with straight dark hair– and a very loud voice. They were selling a restaurant coupon book for their high school football team. And they were doing it in such a way that I was trapped standing out in the sun while they gave me their sales pitch. Frick: [gliding smoothly into my path toward the door] Hi! We’re selling a coupon book with lots of really awesome stickers in it for our football team. Frack: [loudly, jumping to the side of Frick] They’re not stickers…. THEY’RE COUPONS. FOR RESTAURANTS. Frack: [loudly, pushing Frick aside] GREAT DEALS. Frack: [loudly, jumping to the other side of Frick] GOOD COUPONS. Frack: [loudly, standing behind Frick trying to jump high enough to see me over his head] GREAT DEALS. [jump] FOR RESTAURANTS. Frick: [sighing and allowing Frack to stand beside him] … for only $20.00. Frack: [loudly, bouncing in place] TWENTY DOLLARS. Now anyone who knows me knows that I’ll buy just about anything from a kid. And anyone who knows me knows that I’ll do just about anything to not stand out in the hot sun. Meaning that this transaction was a done deal before the first word came out of Frick’s mouth. So I bought one of the coupon books. I doubt that we’ll ever use anything in there, but that doesn’t matter. The entertainment value of Frick & Frack’s sales pitch was priceless. Definitely one of the best I’ve experienced in a long time. It makes me think that someone over at the local high school is doing something right. What exactly that right thing is, I’m not sure. But something. ‘Cuz man-oh-man, those two boys were effective. And funny. I was at the supermarket checking out at one of the four U-Scan areas. I swiped a six-pack of beer across the scanner and it registered the price. The scanner screen then stopped, waiting for the employee watching over the U-Scans to bypass the need for me to show ID. But the employee, a kid around 20, didn’t hit the bypass button. He shouted over to me to show him some proof that I was old enough to buy beer. At first, I thought that he was talking to someone else behind me who was checking out. Then I figured that he was joking around with me. After all, I’m closer to Medicare than the magical age of 21. But he wasn’t goofing with me. He was serious. In fact, by then he’d walked over to me and was standing right in front of me, demanding ID. So I yanked my wallet from my purse– which caused my lipstick to go flying onto the bagging area of the U-Scan– and started to show my driver’s license to the guy. And with that, the employee guy picked up my lipstick and handed it to me. Then he walked back to his U-Scan post where he hit the button that allowed me to buy beer. I finished scanning my items without incident and put them in my bags. Then I left the supermarket with a big smile on my face– and a crush on this kid who takes his job very seriously. God bless him and his bad eyesight.